M&M (1983) The 50 foot wooden fishing vessel M&M struck a log and capsized October 26, 1983 near Wrangell. MABEL A (1920) The 32 ton gas screw fishing vessel Mabel A stranded and was lost at 7:00 a.m. Monday December 13, 1920 near “Noise Island”. The vessel departed Ketchikan with three crewmen aboard bound for deep sea fisheries and had accumulated 2.5 tons of fish worth $700. The engine of the Mabel A broke down during a “50 mile gale” allowing the vessel to wash onto an exposed part of “Noise Island”. The gas screw Todd II stood by and got a line aboard, but that parted. The Mabel A was reported to have broken up within two hours. She was valued at $8,000. The crew made it to safety. MABEL M (1965) The 10 ton 32 foot wooden gas screw fishing vessel Mabel M foundered in November of 1965 at Grave Island, Hoonah. MACE (1956) The 10 ton 36 foot wooden gas screw fishing vessel Mace burned May 18, 1956 at Castle Flats. MAGIC MINNOW (1997) The 32 foot crab fishing vessel Magic Minnow was lost from an explosion and engine room fire February 18, 1997 in Gastineau Channel. The Magnhel was valued at $4,000 and became a total loss with no insurance. She was owned by her master, A Lindset and his partner L Skogsaas. MAINE (1949) The 29 ton 45 foot wooden gas screw fishing vessel Maine foundered August 23, 1949 in Lisianski Strait. MAKAKA (1990) The 152 foot steel fish tender Makaka stranded and was lost August 3, 1990 on Fernando Reef. There was no loss of life. MALLARD (1921) The halibut boat Mallard was wrecked in a storm October 27, 1921 on False Island in Clarence Strait. The Mallard was attempting to assist the halibut boat Alta who had stranded. There was no loss of life. MAMOOK (1917) The 17 ton 42 foot gas screw Mamook burned at Eagle Reef August 6, 1917. The two persons aboard made it to safety. MANANA II (1969) The charter vessel Manana II struck a deadhead and sank May 1, 1969 near Sitka. All seven on board escaped to safety. MARCELLA (1972) The 14 ton 39 foot wooden gas screw fishing vessel Marcella foundered June 25, 1972 at Stephens Island. MARGARET (1874) The U S transport schooner Margaret was driven ashore in a heavy snowstorm near the village of Kake March 2, 1874. The vessel departed Sitka February 16, 1874 with captain Harrison at the helm bound for the San Juan Islands of Washington. All three crewmen found safety, but the Margaret was lost and her cargo pillaged by Natives. MARGARET A (1976) The 108 ton oil screw Margaret A foundered November 22, 1976 at Frederick Sound by Turnabout Island. MARGARET J (1957) The 28 ton 49 foot wooden oil screw fishing vessel Margaret J stranded and was lost September 24, 1957 at Sunny Cove, Chomly (Cholmondeley) Sound. MARGARET N (1996) The 30 foot fishing vessel Margaret N sank October 2, 1996 at Hydaburg. Both persons aboard made it to safety. MARGE (1987) The 36 foot fishing vessel Marge sank July 29, 1987 at Grand Island southeast of Ketchikan. MARGIE ANN (1963) The 12 ton 33 foot wooden oil screw fishing vessel Margie Ann burned July 14, 1963 at Fresh Water Bay near Tenakee. MARIAN M (1948) The 34 ton 49 foot wooden oil screw fishing vessel Marian M collided with a dead mine at Salisbury Sound, 60 miles west of Sitka and was lost August 4, 1948. MARIE (1919) The 43 ton 63 foot gas screw fishing vessel Marie burned September 25, 1919 at Sister Island. The 6 crewmen aboard made it to safety. MARIE (1941) The 10 ton 34 foot wooden gas screw fishing vessel Marie stranded and was lost near Kake February 4, 1941. The one person aboard survived the disaster. The Mariechen departed Seattle December 19, 1905 bound for Vladivostock, East Siberia. She had a crew of 50 and a cargo of 5,000 tons of general merchandise worth $100,000. The vessel herself was worth $250,000. At the time the wreck report was filed by Rudolph Heldt, master of the Mariechen, the damage to the vessel and cargo had not been ascertained. Later reports have the vessel salvaged and towed back to Seattle. MARIETTA J (1970) The oil screw Marietta J foundered and was lost August 29, 1970 three miles west of Cape Strait in Frederick Sound. Lost were owner James Gordon, Grant Kadotk and Jim Teenduo. The wreck report was signed by William M Carle, Minister of Gospel. MARINE VIEW (1989) The 82 foot fishing vessel Marine View grounded and sank during a herring opening March 21, 1989 in Kah Shakes Cove. All three crewmembers were able to walk to shore. MARIPOSA (1917) The 3,158 ton 314 foot Alaska Steamship Company steamer Mariposa struck a reef near Point Baker and was lost November 18, 1917. The vessel was carrying 25,000 cases of salmon and 1,200 tons of copper ore as well as 265 passengers. She had departed Anchorage and recently stopped at Shakan to load canned salmon. It was shortly after her departure at 3:00 a.m. from Shakan that the Mariposa ran up on the reef. The passengers were quickly evacuated. Among the passengers aboard the Mariposa were shipwrecked crewmen from the Al-Ki, which was lost November 1st southwest of Juneau and shipwrecked crewmen from the Manhattan, which was lost November 15th in the Gulf of Alaska. There were tensions between the two shipwrecked crews as the Manhattan crew had looted the wreck site of the Al-Ki before the Manhattan sank two weeks later. Tourists were getting their money’s worth of adventure that the Alaska Steamship Company brochures promised. They were seeing the wonder of Alaska, getting to mingle with two different shipwrecked Alaskan crews and finally becoming ship wreck victims themselves. Six hours and 38 minutes after the stranding of the Mariposa, the vessel slid off into the deep carrying the valuable cargos with her. The crew and passengers were taken aboard the Curacao, Ravalli and Jefferson and transported to safety. The reef where the disaster occurred has been renamed Mariposa Reef. MARJO (1996) A 48 foot vessel named Marjo was consumed by fire June 4, 1996 in Salisbury Sound. MARJORIE M (1929) The 14 ton 40 foot gas screw fishing vessel Marjorie M was consumed by fire at Haines in 1929. No one was aboard and no lives were lost at the time of the disaster. MARK CHRISTOPHER (1997) The 49 foot salmon seiner Mark Christopher grounded and sank June 23, 1997 approximately 20 nautical miles east of Sitka. All five crewmembers made it to safety. MARS (1915) The small halibut schooner Mars burned near Petersburg October 14, 1915. A backfire in the engine room ignited the blaze which ended when the vessel was burned to the waterline near Five Fingers Islands. All five crewmembers were able to escape. The Martha was valued at $2,000 and her cargo $1,500. Vessel and cargo were listed as total losses with no insurance. The two crewmen made it to safety. MARTIN D (1974) The 147 ton 80 foot steel oil screw tug Martin D foundered February 15, 1974 at the entrance to Wrangell Narrows in Sumner Strait. Three of her four crewmembers were lost. The barge the vessel was towing was caught by the wind and blown ahead of the tug causing her to capsize and sink. Lost were captain Jack MacKinnon, Jack Sanders (42) and Al Kite (51). Mike MacIntyre (22) was the only survivor. MARVA ANNE (1999) The 58 foot steel longline halibut fishing vessel Marva Anne flooded and sank October 21, 1999 two and a half miles west of Security Bay in Stephens Passage. Both crewmembers donned survival suits and abandoned ship to a life raft. They were rescued by the fishing vessel Celtic Air. The crew of three made it to safety, but the Mary, valued at $100 was lost. There was neither cargo nor insurance. The Mary had sailed from Juneau November 19th bound for Admiralty Island. The Mary was a total loss and had no insurance. She was valued at $2,000 and with no cargo aboard. MARY ANN (1955) The 7 ton 29 foot wooden gas screw fishing vessel Mary Ann was consumed by fire June 8, 1955 in Kendrick Bay on Prince of Wales Island. MARY ELLEN (1943) The 15 ton 39 foot wooden gas screw fishing vessel Mary Ellen burned August 7, 1943 at Icy Point. Both Bindpage and his crewman escaped the disaster, but the Mary G II, valued at $10,600, was a total loss. She was insured for $9,000. MARY J (1933) The 9 ton 36 foot wooden gas screw fishing vessel Mary J foundered near Sitka September 23, 1933. The one person aboard made it to safety. MARY-JO (1960) The 10 ton 39 foot wooden gas screw fishing vessel Mary-Jo burned June 14, 1960 at Kalinin Bay on Kruzof Island. MARY KAY (2012) The 78 foot wooden fish tender Mary Kay experienced severe flooding from a transverse bulkhead into her engine room while hauling gutted salmon from Neets Bay Cannery to Craig July 27, 2012. The vessel was traveling in heavy weather off of Cape Chacon when the four person crew was unable to keep the vessel dewatered from leaks in the lazarette, starboard fish hold and finally her engine room. All four were forced to don survival suits and abandon ship to an inflatable life raft and 10 foot skiff. The Good Samaritan fishing vessel North Wind rescued the crew and returned them to Ketchikan. The Mary L was valued at $800 with no cargo and no insurance. The accident report is dated February 20, 1934. MARY LOU (1967) The diesel screw Mary Lou foundered August 20, 1967 at Little Roller Bay on the west coast of Noyes Island. MARY LOU (1984) The 86 foot trawl fishing vessel Mary Lou was struck by a large wave, rolled over and sank January 22, 1984 off of Cape Decision. The vessel was coming from Seattle on her way to Kodiak. Two crewmembers were lost and three rescued. Lost were skipper and part owner Tom Hansen (33) of Seattle and Fred Blanchard (25) of Portland. Survivors were Tracy Bain (26) of Seattle, Mike York (23) of Moses Lake and David Thomas (41) of Seattle. The Mary Louise was valued at $5,000 and hadn’t been assigned a master. She had last sailed out of Ketchikan August of 1936. MARY MAY (1992) The 41 foot longline halibut fishing vessel Mary May sank without a trace September 11, 1992 near Biorka Island. Jeff Anderson (29) and Robert Enlowe (23) both from Sitka were lost. The body of one was later recovered in Sitka Bay on Kruzof Island. MARY R (1951) The 13 ton 33 foot wooden oil screw fishing vessel Mary R burned May 17, 1951 in Veta Bay. MAURELLE (1997) The 36 foot salmon troller Maurelle was lost in an explosion and fire July 4, 1997 approximately 20 nautical miles northwest of Cape Spencer. All three crewmembers were rescued. MAXINE (1942) The 7 ton 30 foot wooden gas screw fishing vessel Maxine was consumed by fire July 25, 1942 at Hydaburg. 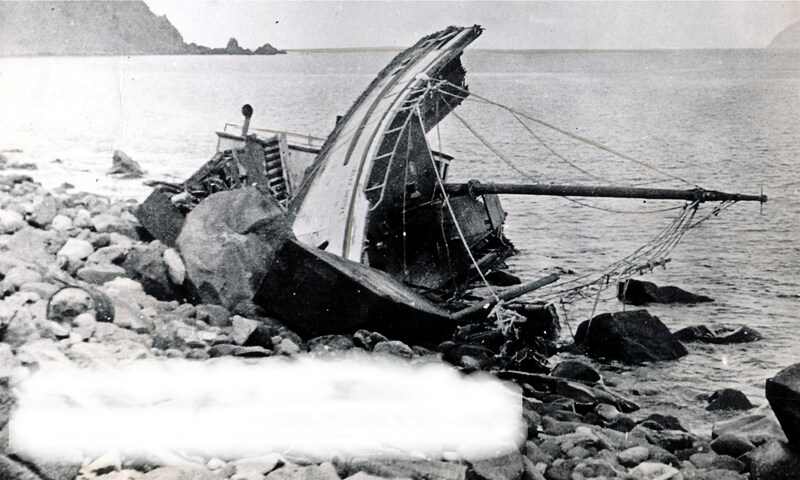 MAXINE M (1958) The 31 ton 44 foot wooden oil screw fishing vessel Maxine M foundered September 24, 1958 off of Dall Head near Gravina Island. Five of the vessel’s six crewmembers were lost. The sixth crewman, Howard Williams, son of the owner of the Maxine M was found alive atop a floating seine table in Clarence Strait. He was picked up along with his deceased father by the fishing vessel Homer. Lost in the disaster were owner James Williams (65), Alfred Dundas, Billy Dundas, Fred Fawcett and Henry Brendible. John Leedy survived the tragedy, but the May, valued at $3,000 was abandoned. The accident reports that the vessel had no insurance and was a $1,600 loss. MAY (1992) The tug May capsized and sank November 22, 1992 in 50 fathoms of water at the mouth of Farragut Bay in Frederick Sound. Only one crewmember survived out of the four on board. Lost were David J. Seelye (45) of Wrangell, Jay W. Ellis (42) of Wrangell and Randy S. Janisch (35) of Washington state. First Mate Wally Mizell was on deck when the vessel capsized and after being pulled down by the sinking vessel, swam free and was able to locate a liferaft. He was rescued 13 hours later. The crew all made it to safety, but the vessel and her cargo were a total loss. The McKinley was loaded with 54,000 lbs. of fish valued at $3,500. The vessel was valued at $28,000. Insurance on the vessel was $20,000 but there was none on the cargo of fish. MELISSA K (1989) The 24 foot herring fishing vessel Melissa K grounded in heavy weather and broke up on the rocks March 30, 1989 on Survey Point, Annette Island. MELODY (1992) The 42 foot longline fishing vessel Melody developed rudder problems, washed up on a ledge and sank May 23, 1992 northwest of Baker Island. Both persons aboard made it to safety. MEMORIES (1997) The 49 foot shrimp pot fishing vessel Memories grounded and sank October 28, 1997 in Wrangell Narrows. The operator fell asleep at the wheel causing the disaster. Both persons on board made it to safety. MENOQUET (19??) The 197 ton 106 foot wooden electric oil screw tug Menoquet foundered sometime before 1979 at Katlian Bay. Originally a Navy Tug doing service in WWII in the Pacific, she was stricken from the Navy List in May of 1959. MERCER N0 1 (1943) The barge Mercer No 1 broke loose from the gas boat Highway and was lost March 5, 1943 at Lena Point. Wreckage of the Highway was found near Ralston Island. All 6 or 7 crewmembers were lost in the disaster. MERCURY (1898) The 1050 ton 193 foot wooden ship Mercury stranded in Skagway Harbor at 2 a.m. April 11, 1898. The vessel had sailed out of Seattle, Washington March 27, 1898 with a crew of 40. She was carrying 1,500 tons of general merchandise worth $20,000. The Mercury drug anchor in a 60 mile an hour gale that was “blowing too hard”. The Mercury was listed with of value $8,000 with $4,000 worth of damage as a result of the stranding. The report also lists $10,000 worth of cargo lost. There was no insurance on the Mercury. The vessel was eventually refloated and put back in service as a barge. MERCY BEE (1981) The fishing vessel Mercy Bee capsized in heavy surf January 1, 1981 in Squaw Bay. MERRIE COLLEEN (1993) The 58 foot salmon seiner Merrie Colleen burned to the waterline and sank September 11, 1993 near Nichols Island. All four crewmembers abandoned ship to a 10 foot skiff and were picked up by the 22 foot research boat Cape Henry. The Mexico was valued at $100,000 at the time of the disaster. All passengers and crew made it to safety but the vessel and her cargo were lost. MICHO (1959) The 21 ton 34 foot wooden oil screw Micho was consumed by fire August 21, 1959 at Smeaton Bay. MIKIE (1955) The 7 ton 28 foot wooden gas screw fishing vessel Mikie was consumed by fire September 16, 1955 in Fortuna Strait near Chichagof Island. MIKKIDURA (1927) The 10 ton wooden auxiliary schooner Mikkidura caught fire at 4:30 a.m. Wednesday July 27, 1927 in Barlow Cove. The vessel departed Juneau July 26th bound for Lincoln Island via Barlow Cove with two aboard. Pyrene and seawater were used to attempt to extinguish the blaze. It was a clear night with calm seas and the Mikkidura had been at anchor all night. The two aboard escaped to safety, but the vessel became a total loss. The Mikkidura was valued at $7,000 and had no cargo at the time of the disaster. The cause of the fire was unknown. MILDRED (1954) The 12 ton 50 foot wooden oil screw fishing vessel Mildred burned February 12, 1954, one and one half miles northeast of East Point on Woronkofski Island. The Mildred II, worth $10,000 and her cargo of halibut were lost. The crew made it to safety. MILLER’S BAY (1976) The 34 foot gasoline powered salmon troller Miller’s Bay went missing with a family of three on board July 25, 1976 off of Noyes Island 150 miles south of Juneau. Lost were Robert West (31), his wife Judy (30) and their 14 year old daughter Brenda. The Wests were salmon fishing at the time of the disaster. MILLVILLE (1924) A fire of unknown origin destroyed the 22 ton wooden gas screw Millville December 18, 1924. The vessel was laid up for winter at Pybus Bay when the disaster occurred. There was no one aboard and no cargo. The Millville was valued at $2,000 and had $2,000 worth of insurance. MINNIE (1926) The 8 ton 34 foot gas screw fishing vessel Minnie burned June 20, 1926 in Excursion Inlet. The one person aboard at the time of the casualty made it to safety. The Minnie was valued at $4,500 at the time of the tragedy. She had no cargo aboard. Her insurance was in the amount of $3,111.11. MINNIE K (1964) The 10 ton 30 foot wooden gas screw fishing vessel Minnie K foundered June 12, 1964 at Meyers Chuck. MIRA (1973) The 10 ton 32 foot wooden gas screw fishing vessel Mira stranded and was lost August 19, 1973 in Frederick Sound near Cape Strait. MISCHIEF (1943) The 9 ton 34 foot wooden gas screw fishing vessel Mischief was consumed by fire June 1, 1943 at Ketchikan. MISS AURORA (1976) The 22 ton oil screw Miss Aurora foundered September 27, 1976 one and a half miles off of Point Lull at the entrance to Kelp Bay, Chatham Strait. MISS DOREEN (1995) The 40 foot fishing vessel Miss Doreen capsized and sank while at anchor June 15, 1995 in a bay near Petersburg. All three persons aboard were asleep when the vessel began to capsize during the night. The two men aboard were able to escape, but 10 year old Corrina Caples of Petersburg was lost. MISS EVERETT (2003) The 34 foot wooden troller Miss Everett sank due to unknown causes July 8, 2003 near Kruzof Island approximately 10 miles north of Sitka near Point Amelia. The only person aboard, Ted Hahler, was lost with the Miss Everett. MISS LACE (1951) The 14 ton 35 foot wooden gas screw fishing vessel Miss Lace burned October 14, 1951 off of Steamer Point, Clarence Strait. The Mission was valued at $2,000 and reported as a total loss. It was unknown at the time of the report whether there was any insurance. MIST (1894) The 18 ton 50 foot wooden schooner Mist parted her anchor chains and was lost in a storm at 7:00 p.m. Friday October 12, 1894 at Sitka. The crew of three survived and made it to safety, but the Mist drifted ashore and went to pieces. High seas, high winds and a dark stormy night were reported at the time. The Mist was valued at $600 and had no cargo and no insurance. MIST (1961) The 17 ton 39 foot wooden gas screw fishing vessel Mist foundered August 4, 1961 at Mount Edgecumbe Dock, Sitka. MISTRESS (1999) The 42 foot fiberglass crab fishing vessel Mistress capsized and sank in bad weather November 3, 1999 in the vicinity of Cape Fanshaw near Petersburg. All three crewmembers were lost including captain James Odegard (47), his daughter Renee Odegard (22) and son Eric Odegard (25). The Mitchell was valued at $2,000 and had no insurance. Adamson made it to safety and filed an accident report in Juneau soon after. MITKOF (2004) The 75 foot wooden fish tender Mitkof struck a rock and sank at 1:57 a.m. August 5, 2004 approximately 10 miles north of Petersburg. The disaster was attributed to the operator falling asleep at the wheel and grounding near Sukoi Island. The owner of the Mitkof took the helm after the grounding and attempted to run the vessel aground on a beach nearby, but she sank enroute. The vessel was carrying 160,000 pounds of fish. All four crewmembers were rescued by the fishing vessel Angjenl. MOCKINGBIRD (1899) The vessel Mockingbird was lost at Dyea Harbor December of 1899. MOJO (1988) The 28 foot fishing vessel Mojo sank when her anchor line tangled July 25, 1988 in Cameron Bay south of Sitka. Jim Trow (62), owner and operator of the Mojo was lost after being pulled from the water by the fishing vessel Sefora. Two crewmembers were rescued from the water by a U S Coast Guard Helicopter. MONO (1898) The 88 ton British steamer Mono was washed up on the rocks in Clarence Strait July 23, 1898. She had been under tow by the vessel Fastnet along with the British steamer Stikine Chief, also in tow. As the Fastnet made a turn down Snow Passage to escape freshening southeasterly weather, the towline to the Mono parted and the vessel was set adrift. While the Fastnet was towing the Stikine Chief to safety on the northwest side of Bushy Island, the Mono drifted NW. The crew aboard the Mono attempted to set anchors to slow the drifting vessel but the Mono blew up onto the rocks on the SE end of Bushy Island. The tide was very high so the Mono was carried over the reefs and high onto the rocks at the south end of the Island. Much of the cargo was salvaged when the tide receded but the Mono was a total loss. The Montana was valued at $16,000 at the time of the disaster and was a total loss including cargo. The crew all made it to safety. There was a total of $14,000 worth of insurance. The Montclair was valued at $5,000 and was reported a total loss with no insurance. The crew made it to safety. MORZHOVOI (1955) The 81 ton 80 foot wooden oil screw Morzhovoi burned June 10, 1955 in Funter Bay, Clarence Strait. MRS (2005) The 48 foot wooden shrimp fishing vessel MRS capsized and sank October 14, 2005 near Grindall Island, Kasaan Bay in Clarence Strait. All three persons aboard were rescued from the water by the Good Samaritan Vessel Lady Mae. One crewmember and an observer survived the disaster, but the master of the MRS, Ryan Miller was too long in the 53 degree water and did not survive. Miller was lowering stabilizers when the vessel rolled over. The stacks of shrimp pots on deck, a home-made freezer filled with 7,000 lbs of shrimp and empty voids and tanks below deck were all thought to have contributed to the vessel’s instability. MS TRACIE (2000) The 50 foot wooden salmon fishing vessel Ms Tracie flooded from a faulty shaft packing, sprung a plank and sank August 16, 2000 off of Cedar Point, Metlakatla. All six crewmembers abandoned the vessel to a skiff and were rescued by the fishing vessel Island Dancer. MULE (1964) The 31 ton 52 foot steel oil screw fishing vessel Mule was destroyed by a storm April 4, 1964 near Cape Spencer. MUNROE (1969) The 30 ton 46 foot wooden oil screw Munroe collided with an iceberg and was lost August 29, 1969 in Stephens Passage. MUSHER (1941) The 6 ton 28 foot wooden gas screw fishing vessel Musher was consumed by fire July 13, 1941 in Sitka Sound. The two persons aboard made it to safety. MYRNA (1937) The 11 ton 34 foot wooden gas screw fishing vessel Myrna was destroyed by fire at Wrangell September 29, 1937. The three persons aboard made it to safety. MYRTLE D (1997) The 33 foot salmon troller Myrtle D grounded and was lost August 24, 1997 at Elfin Cove. The operator sleeping at the wheel was blamed for the disaster. There was no loss of life. I’m interested in the details of the sinking of the seiner Marietta J, out of Petersburg, Norman Tate, captain, sometime in August of 1970 (I’m pretty sure). I worked on this boat in 1969 and 1970 as a deckhand, and in August of 1970 I left to go back to Juneau (my hometown) and return to college. Norman Tate’s wife, Vange Tate, wrote my mother some weeks later that the Marietta J had gone out on a trip immediately after I left, and been struck by a power barge in the early morning hours as it was returning to Petersburg. It sank in about 20 minutes, with no casualties. The crew got into the skiff, cut the seine loose, and escaped. The seine later floated up badly torn from being caught on the power block and boom. This is all I know. Norman Tate had two daughters (one was named Roundtree [or “Rountree”] by marriage), and they may still be in Petersburg. In fact, “Fuzzy” Roundtree, her husband, may have been on the boat when it sank. That’s all I have, and I’ve searched as well as I’m able on the Internet for more information for some years. I’m very curious about the exact location of this sinking, exactly what happened, who was at fault, and perhaps some details of the crew’s experience, as you might expect. miles west of Cape Strait in Frederick Sound.” I will do some follow up research and see what I can find, but what you have posted is very helpful.